Briggett has been around EMS her whole life, as many of her family members volunteered with their fire department and ambulance service—her grandmother was a volunteer Paramedic for 40 years, and a great one at that. Believing that she wouldn’t follow in her family member’s footsteps due to her uneasiness around blood, though, Briggett decided to pursue a career in music at Oregon State University. 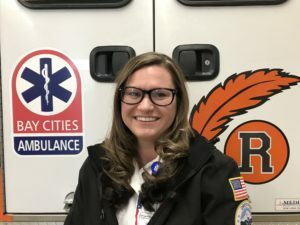 During a break from school, Briggett attended two events where her friends needed medical attention, and that led her to realize that EMS, not music, was her true calling. Briggett has been a Paramedic for three years now, and she is truly loving it. She enjoys the people she works with every day—the hospital staff, fire department, police department, and her coworkers. She is proud to serve her community, and everyone at Bay Cities Ambulance is proud of her. When she’s not serving her community, Briggett enjoys spending time with her daughter, Carryn, and niece and nephew, Ireland and Crew. She also enjoys hunting, fishing, softball, and playing the piano. Briggett received the Paramedic of the Year award, and we are excited to nominate her as a 2018 Star of Life.